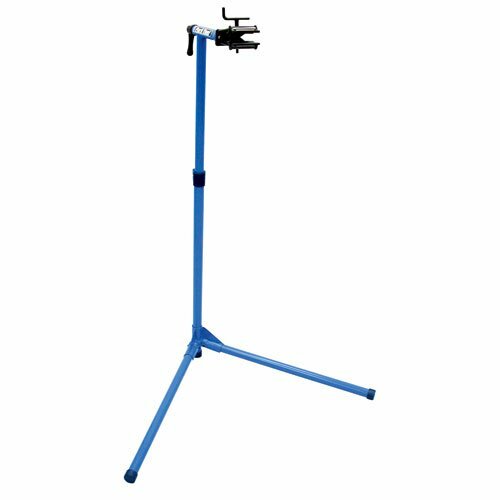 Whether you’re a professional racer or a casual biker, you’ll want to have the best bike repair stand. With this equipment, you can easily hoist your bicycle up and finish doing the necessary repairs in a quick and efficient way. You’ll also avoid straining your muscles since you bike will be at eye level and you won’t have to bend too much to reach it. 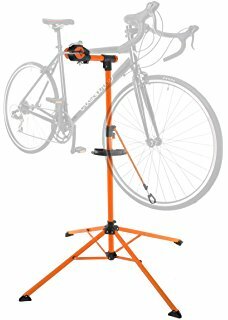 This stand comes with a 360-degree rotating clamp, so you have the option to attach it to the seat post or the top tube. It’s made of durable full alloy aluminum (which means it can withstand wear and tear and last for a long time), and its quick-release adjustable design allows it to extend up to 59 inches. It weighs only 10.75 lbs, but it can accommodate as much as 55.1 lbs of bike weight. If you need a stand that you can take around anywhere, this is one of your best options. It comes with four sturdy legs that keep the stand stable when you’re using it and can be folded for easy transportation. The stand can be adjusted up to 72 inches, and it comes with a rotating head that allows the clamp to be adjusted at any angle. The clamp itself can accommodate tubes up to 75mm in size and can fit most bike sizes. 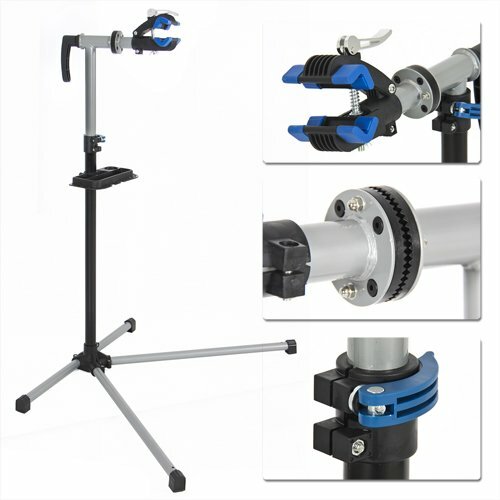 This stand’s telescoping design allows it to extend its height up to 68 ¼ inches, while its quick-release clamp rotates 360 degrees, fits standard frames up to 2.5 inches, and securely locks your bike in place so you can work on it with ease. The stand’s durable construction lets it accommodate up to 66 lbs of bike weight, making it ideal if you have a large and heavy-duty bicycle. On top of this, it comes with a sizable tool tray that has a built-in magnetic compartment to keep small parts safe. 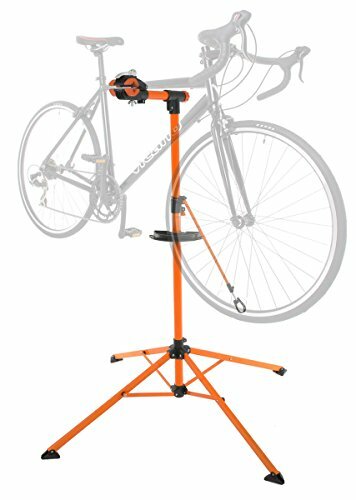 One of the best things about this model is its easy setup and assembly — it even comes with pre-drilled feet that lets you easily mount the bike repair stand on the floor or your work bench. It also comes with “Work Horse” clamps that don’t only have a 360-degree rotation on two axes but can also hold up to 66 lbs and fit tube frames between 1 inch to 1.5 inches. The clamps are designed to be gentle on bike finishes and won’t leave your bicycle with dents and scratches. 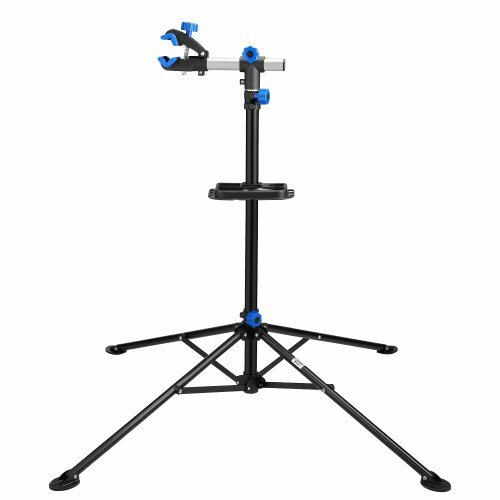 Screw type clamp adjusts to fit tubes from 7/8 to 3"
This stand, which is measures only 41 inches when you fold it, is another excellent choice if storage and portability are important factors for you. Aside from being easy to store and lug around, it comes with a screw-type clamp that rotates 360 degrees to give you easy access to all parts of your bike. The clamp can fit tubes between 7/8 inches to 3 inches and can even accommodate aero-shaped seat posts. 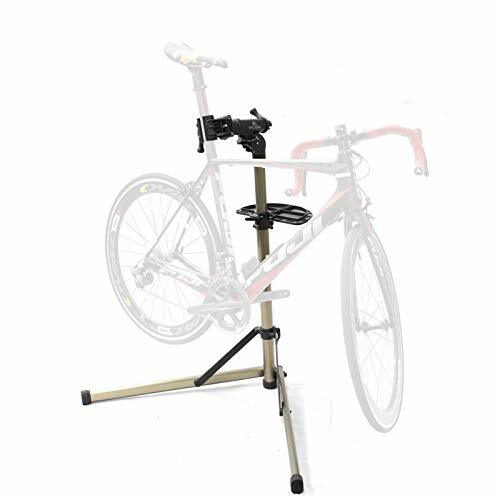 Check out these products now to find the best bike repair stand!